• Capacity: 60 cigars (based on Montecristo no 4 sized cigars). 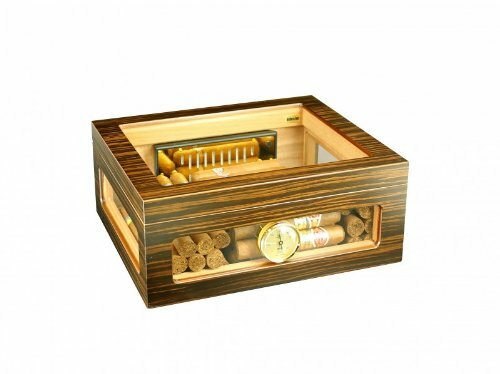 • The glass left, right and front of the humidor, and the glass lid allows unobstructed view of the cigars without having to open the humidor. • Pre-calibrated high precision hair hygrometer, optimized for cigar storage. • Gold plated acryl polymer based adorini deluxe humidifier with adjustable ventilation openings for an optimum regulation of the humidity level. • Unique ventilation ribs ("RibTech") for improved air circulation within humidor. Protected adorini innovation. • Extra-strong humidor corpus and extra-strong Spanish cedar lining. • Hygrometer and humidifier fixed with magnet to invisible metal plate under wood veneer. • Innovative divider system for flexible individual separation. Protected adorini innovation. • Label clips for dividers. Protected adorini innovation. • Extra-strong quadrant hinges - 24K gold plated and hand polished. Deluxe Personal Altar with Shelf - EarthBench - Solid WALNUT Construction for Meditation, Prayer, or Contemplative Studies.